The quadruplets recently turned 7 months old and have settled into a pretty great routine. They're about to start crawling and things are going to get wild, so at the risk of forgetting how easy they are right now, I thought I would chronicle the babies' current routine and schedule. The best development in our schedule to date has been the babies now finally sleeping through the night. They wake up between 6 and 7 am but are content to play in their cribs until 7 am...on the dot. But come 7, they want your attention - and more importantly, they want their bottles. Charlie and I usually feed them together and it's pretty chaotic until they get those bottles in their sweet little mouths. Dillon is still the champion eater and can put his down in about 5 minutes. Claire and Charlie spend more time playing with their bottle than actually eating. And Henry is somewhere in the middle of the pack and a pretty consistently good eater. Right now everyone is eating an 8 oz bottle 3 times a day at 7am, 12pm and 6pm (down from four 6-oz bottles a few weeks ago). Our pediatrician described this as an "aggressive" feeding schedule for 7 month old preemies, but it's working for us so we are sticking with it. After breakfast bottles the babies usually play from 7:30 - 9:00 am. Our house has morphed into a plastic garden and there are all sorts of obnoxiously large exersaucers and bouncy chairs scattered about that the babies really seem to enjoy being confined to for small periods of time. After post bottle playtime we hit the hay for morning nap. The quads are sleeping from about 9-11am, sometimes noon if you're lucky. After naps they play up until their next feeding around 12 or 12:30 pm. At this point we usually take advantage of their emptying bellies to get some tummy time in (because full bellies on their belly = barf city). Rather surprisingly, Dillon is the first to sit up (and stay up) on his own. He hates tummy time so much that he just skipped right to sitting. Charlie is the strongest on his stomach and he is dangerously close to crawling. Physically, Charlie is so much more advanced than the other babies right now. Emotionally though, he is still such a little cry baby. After lunchtime bottles Molly and the babies go down from 1-3 or 1-4 pm. This is prime time for getting anything and everything done. I never realized how much you can do in 2 or 3 hours if that's the only quiet time you know you're going to get for awhile. We like to spend the time after afternoon naps either outside in our front yard or going to the park. Our neighbors and family stop by and thankfully everyone knows they have a standing invitation to stop by to help feed the babies or Molly and join us for happy hour around the 6 pm feeding time. Our bedtime routine starts at 7:00 pm. It takes about 30 minutes to get everyone changed and settled down. They are all in cribs by 7:30 pm and the screaming usually stops around 8:00 pm. From 8:00 pm on it is smooth sailing for most of the night. The babies just started sleeping in their own cribs - we have two real cribs and two portable cribs in their room. It's tight but having their own space seems to help with sleeping through the night. Claire will start crying about 4:00 am, needing her pacifier put back in about every 15-30 minutes. I will say that Charlie and I get quite the workout going up and down the stairs to the baby room to keep her quiet until 7:00 am bottles start the new day. Outside of the daily routine, we have had an exciting few weeks. 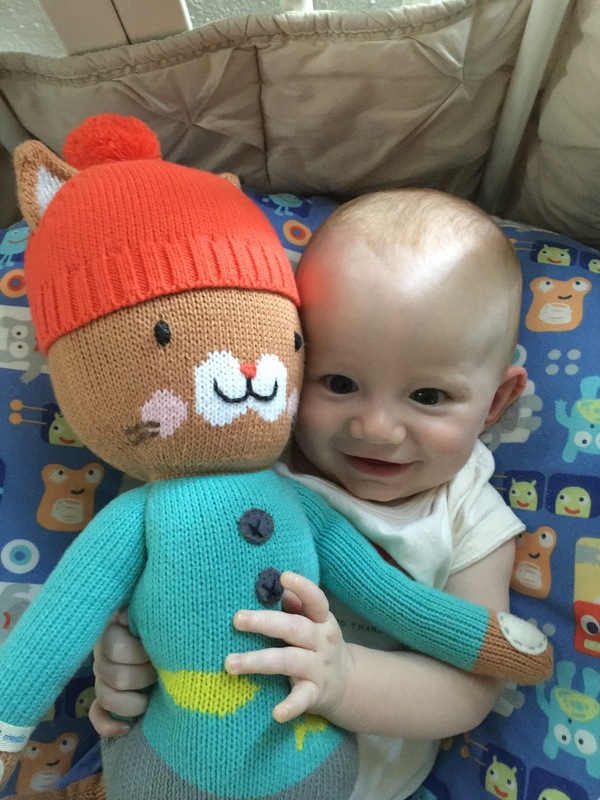 The Moll Doll turned 2 on July 28. We celebrated at the beach and with a beautiful Wheels on the Bus cake made by our great friend Honey. Right now Molly is really into playing tea party, dressing up, photo-bombing baby pictures and just generally being adorable and most-of-the-time agreeable. She is saying so many new words every day and has actually started eating a little better too. 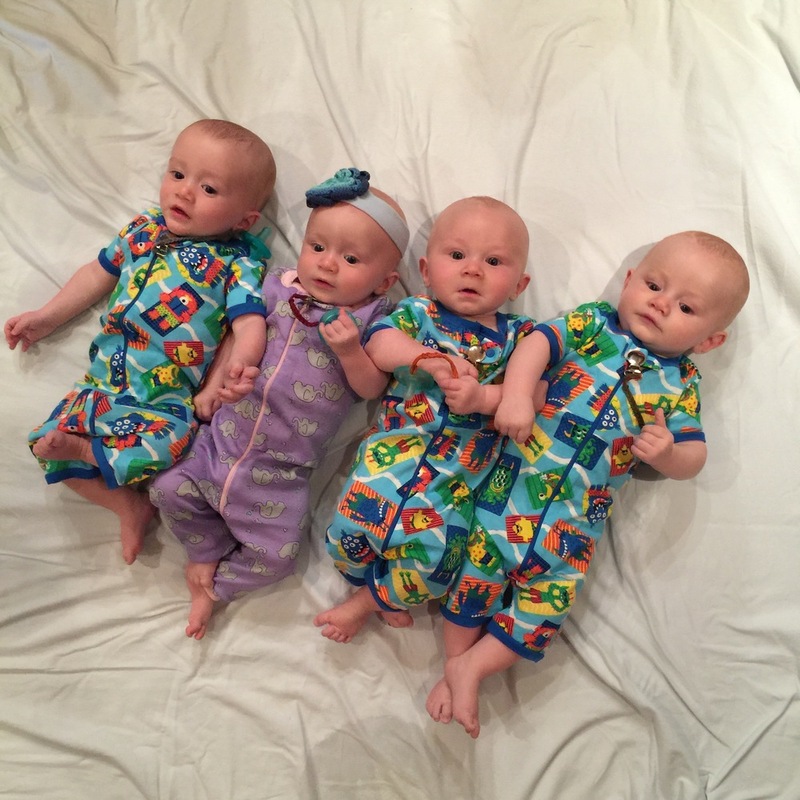 Recently we had all of the quadruplets assessed for whether or not they need a helmet for plagiocephaly (flat heads). As much as we try, they still spend too much time on their backs and coupled with being born prematurely, a few of the babies have ended up with flattish heads. Dillon's is the most pronounced and he is the one most likely to need a helmet pretty soon here. We have a follow up appointment for him next week to see if he really needs the helmet. I'm hoping his improved posture from sitting has self-corrected his flat head, but we shall see. We have been spending the summer going to the beach, for walks in our neighborhood, the San Diego night zoo and have had some dinner parties with friends and family at home. A mom of older kid quadruplets recently reminded me in a comment that, "The days are long but the years are short." When it's just Charlie and I with the babies, the weekend days in particular seem to be SUPER long, so we occupy ourselves by finding activities or family and friends to visit or impose upon. We've had a few visitors ourselves recently. Rocio came to visit from Mexico City and our cousins Jack and Bridget were in town from Pennsylvania. We've been going to outdoor concerts on the weekend nights (preferably ones where the band is louder than the babies) and we also celebrated our cousin Ellamae's 2nd birthday this month too. We have been on playdates with friends old and young, been watching a LOT of Olympic gymnastics and we are always looking for a pool to crash. Molly is really into swimming right now, so we try to oblige her a few times each week by finding a pool for her to practice her strokes. 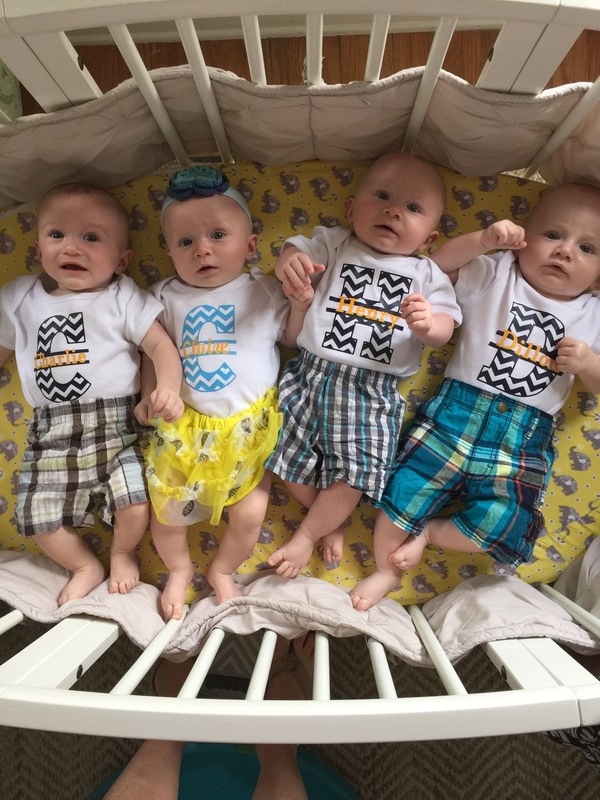 Last week the quads were on the FOX5 San Diego for a "Must Have for New Moms and Babies" segment. Despite four snotty noses, they were pretty well behaved for their few minutes of fame. So that's about it from baby central. We no longer have 5 kids under 2, but 4 is still proving to be a good deal of work! To close it out, here are a few more pics of the babies and Molly together from the past few weeks.